Zambie, offeecially the Republic o Zambie (/[unsupported input]ˈzæmbiə/) is a landlocked kintra in Soothren Africae. 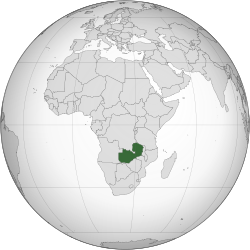 The neighbourin kintras are the Democratic Republic o the Congo tae the north, Tanzanie tae the north-east, Malawi tae the east, Mozambique, Zimbabwe, Botswana an Namibie tae the sooth, an Angolae tae the wast. The caipital ceety is Lusaka, locatit in the sooth-central pairt o the kintra. The population is concentratit mainly aroond the Lusaka in the sooth an the Copperbelt tae the northwast. ↑ Central Statistical Office, Government of Zambia. "2010 Census Population Summaries". Archived frae the oreeginal on 21 January 2012. Retrieved 13 November 2012. ↑ 5.0 5.1 5.2 5.3 "Zambia". International Monetary Fund. Wikimedia Commons haes media relatit tae Zambia. This page wis last eeditit on 9 Februar 2018, at 07:02.